The following information is to help the reader understand some, but not all, of the genealogical sources and to provide more precise information. This was primarily researched by Manley H. Mitton (b.1908-d.2005). The family tree below shows the Horton-in-Ribblesdale to Canada/US genealogy beginning with ‘Squire’ Joseph Mitton. However the dates are wrong and refer to his grandfather who was also named Joseph. ‘Squire’ Mitton was born Nov. 11 1723 and died Nov. 25 1792 in Starbotton. 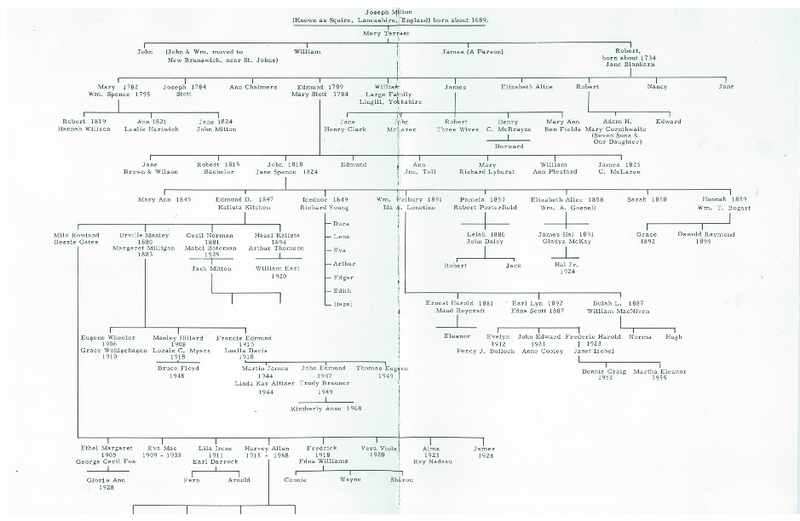 This was Manley H. Mitton genealogy he put together in the 1970s. It has the corrected dates of "Squire" Joseph Mitton, 1723-92. Squire Josephs three grandsons emigrated from Horton to Kent County Canada starting in 1818-19. The first was Edmund, married to Mary Stott. Then Joseph married to the other Stott sister. And the third brother James. This accounts for the many Mittons in Kent County Ontario by the end of the century. Two brothers had married two sisters (Stotts) which is probably why they followed each other to Canada.